Experience the thrill of sailing the Barbados coastline with a Hobie cat cruise! These small catamarans are perfect for a group of 3-4 people. The calm waters of the west coast are ideal for a relaxing sail past white sand beaches and over tropical reefs. The lively waves on the south coast of the island provide more of a thrill as you head out but you're quickly in calmer water just offshore. Hobie cats are available from watersports operators at many beaches along the west and south coast including Dover Beach and Sandy Lane. 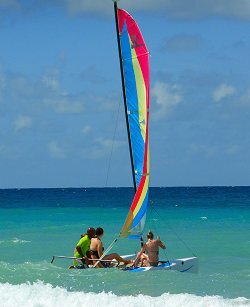 Many Barbados hotels also offer hobie cat rides, and it is often included in the watersports activities at all-inclusive resorts. Take a panoramic tour of Barbados from coast to coast, then enjoy a couple of hours of beach time on this Beach and Island Tour.